The four old Frontier Brains (Darkkend, TheCyberMew, sN0wBaLL abd FireStarter) have been promoted to TBAs. What are TBAs? Well it's TBA. In other news, Flaming_Wuzzle and I have earnt ourselves the 'Fails At Life' rank for a day Don't ask what we did but it was hella dumb. We arent banned. Last edited by Amphy on Sat Oct 07, 2006 9:25 pm, edited 1 time in total. Congratulations to the people who have been promoted. I wonder what the new TBA rank is going to be. Congrats, BBD, Krisp, Jigglypuff, Darkkend, TheCyberMew, sN0wBaLL, FireStarter, Skull Kid and Flaming_Wuzzle! Can't wait to find out what a TBA is! I had a dream Miasma became a mod for speaking very formally and being very proper in the British way even if he doesnt live in England. Well, well done BabyBlueDragon, even though I rarely see him post a lot anymore, I guess he's in the chats a lot though. Well done to the other unconfirmed mod who hasnt replied too. TBA? To be announced...? Well, well done on that sNOwBaLL, etc etc. Dont know why amphy was though. And, congrats to the mods being promoted! use youre new mod powers for good, and not for evil! EDIT: The new one is Regal chilin! congratulations! 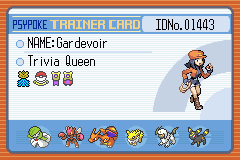 Please not: Gardevoir and Regal are only mods of their team forums until we sort the teams out, they aren't Gym Leaders but do have the Bold Blue names. Yup, I'm only a temporary mod. But the bold blue name is cool. Anyways, I thought of a couple names. Last edited by Gardevoir on Sun Oct 08, 2006 12:06 am, edited 2 times in total. Cool! DatVu got the job! Last edited by DisehMoh on Sun Oct 08, 2006 12:16 am, edited 1 time in total. You know those people in the game that can change your name or you Pokemon name? Name raters? Can they be Psypoke raters? Actually that was awful. Psypoke Co-ordinators (or whatever May is). GJ to whoever got promoted. I am so bored so I am erasing your signature. The people with the new rank are mods as well, heartofdarkness. Last edited by Valentine on Sun Oct 08, 2006 8:06 am, edited 1 time in total. I really like this idea. If you put it into perspective, the TBA's are very much like the Oak Aides. I had mentioned something like "Psypoke Elder" in the chats. However, one may take that as an old person. Its hard to think of something between Frontier Brain and Elite Four. Location: Behind you with a butcher knife! BOO!